Large crane models need large slewing bearings. 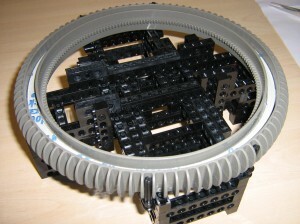 The standard Lego Technic turntable proved to be unable to deal with the tipping moment that occurs when lifting a weight or even when fully topping out the jib of a large crane. In my model of a Figee crane I used a standard turntable, created a flat surface under the upper carriage of the crane and added 4 wheels under the carriage travelling in a circle over that flat surface. These sets are quite rare in The Netherlands, but I was lucky to buy one from a guy in Germany, via E-bay. I decided to use wedge belt wheels to run between the upper and lower bearing halves. To achieve shooth running I had to keep them at equal distances from each other, but this created a new problem: the “gutters” in the hailfire droid gear wheels are too deep, so the axle connectors (black on the photo) touch the rim of the gutter. I solved this by laying 2 packing rings of almost 2 mm each in the gutters. See photo below. By the way, the blue distance parts between the wheels aren’t Lego either, but insulated electric wire. This must be terrible for the real Lego purists. The wheels now turn very smoothly, even with the other bearing halve on top. 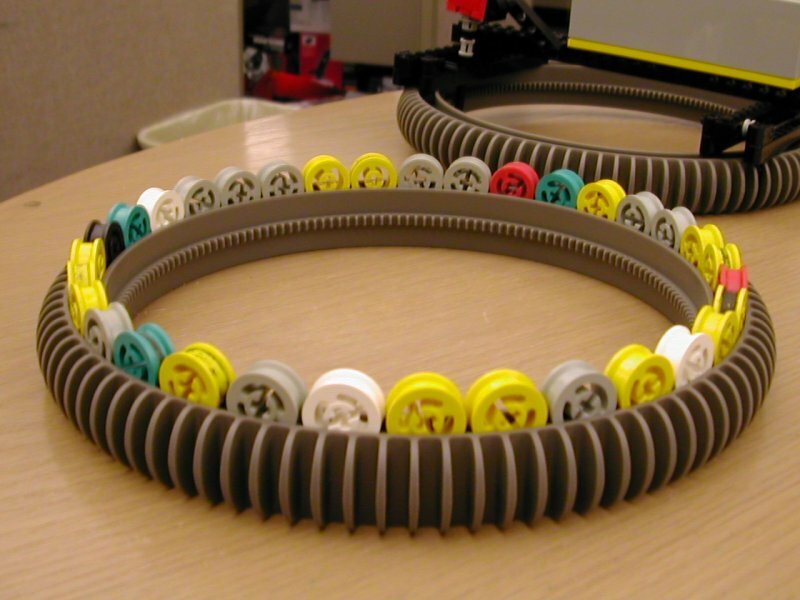 The hail fire droid gear wheels have no connecting point for other parts, so if used in a crane, they will have to be held together somehow. They are centered with 4 axles which fit nicely in the outside gear ring as can be seen in the photo’s above, which show the upper bearing halve upside down, with some of the construction of the upper part of the crane already in place. Shown here is the lower bearing halve, with construction attached for the lower part of the crane. Into this construction a turntable is built. Through the centre of the turntable 2 liftarms protrude upward, holding the the construction that holds the two pinion wheels. The upper part is fitted on top and secured with an axle through the liftarms.